Rensselaer researchers partnered with Finch Paper in Glens Falls, New York, which provided the lignosulfonate. The researchers have so far created a lithium-sulfur battery prototype that is the size of a watch battery, which can cycle about 200 times. April 12, 2018 (Rensselaer Polytechnic Institute) - A major byproduct in the papermaking industry is lignosulfonate, a sulfonated carbon waste material, which is typically combusted on site, releasing CO2 into the atmosphere after sulfur has been captured for reuse. A rechargeable battery has two electrodes — a positive cathode and a negative anode. Placed in between the electrodes is a liquid electrolyte that serves as a medium for the chemical reactions that produce electric current. In a lithium-sulfur battery, the cathode is composed of a sulfur-carbon matrix, and a lithium metal oxide is used for the anode. In its elemental form, sulfur is nonconductive, but when combined with carbon at elevated temperatures, it becomes highly conductive, allowing it to be used in novel battery technologies. The challenge, however, is that sulfur can easily dissolve into a battery's electrolyte, causing the electrodes on either side to deteriorate after only a few cycles. 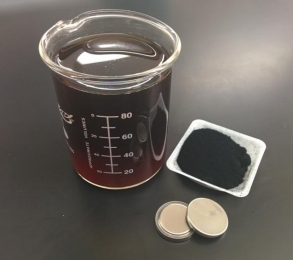 The research team has so far created a lithium-sulfur battery prototype that is the size of a watch battery, which can cycle about 200 times. The next step is to scale up the prototype to markedly increase the discharge rate and the battery's cycle life. The original story can be found at RPI's website: Building Lithium-Sulfur Batteries with Paper Biomass.